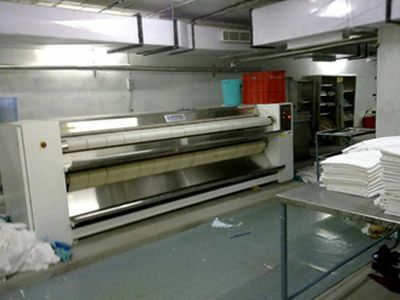 The Laundry caters to various hotels, hospitals etc. It is located at Rasoolpura, Begumpet, Hyderabad. The article discusses different services in a laundry namely water supply, drainage, electricity, fire safety and return air ducts. The total area of the Laundry is 10,000sqft. Dry Cleaning Machines = 2 (Clothes upto 40kg can be washed in one go. The cycle of the machine is of around 30 to 40 minutes). Wet Washing Machines = 2 (60 pieces can be washed at a time. 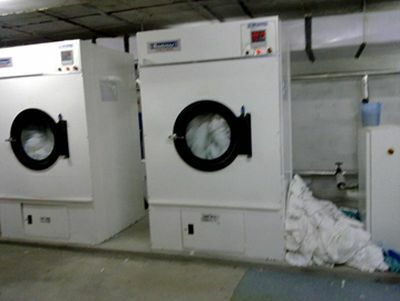 The maximum capacity machine available in the laundry can take upto 80 pieces at a time). Laundry consumes large amount of water for washing purpose. The average quantity of water required per day in the Laundry = 6000 to 8000 litres. The Laundry has its own water Purification Plant. The water from the bore is sent for the purification to the plant which is then collected in the sump and later on pumped to the Overhead tank for usage. Most of the machines in the laundry excluding Wet Washing Machine work on the power of steam. There are Boilers in the Laundry which generate steam under large pressure and is sent to the different machines through pipes connecting the individual machines. The piping is insulated to protect the temperature of the steam from dropping down. The steam produced by the boiler is “100% dry steam” which is considered to be very good for clothes. 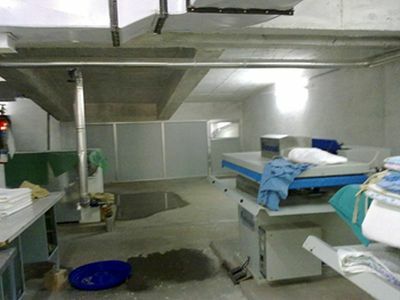 The Laundry flooring material used was Shahbad Stone and graded to floor drainage outlets to prevent pooling of water. Drainage outlets were located adjacent to water supply points including Wet Washing Machines and Basins. The chances of a breakout of fire in a Laundry is very rare. Fire Extinguishers have been used as a measure for fire safety. The fire extinguishers were placed along the exit route passing through the main thoroughfare. They were placed at a distance of 30mc/c approximately and at a height of 1.5m from the floor. The danger of fire breakout caused due to electrical appliances has also been taken into consideration for the design of the laundry. As a preventive measure for electrical fires, the extinguisher was located 40m away from the appliances. The current from the service wire first passes through breakers that step down the voltage, then it goes to the transformers where it is stepped down even more in order to generate enough voltage for the consumption by the Laundry. There is a control panel placed adjacent to the storage area in the Laundry. Exit signs were incorporated in the Laundry design to direct people to exit doors in the case of an emergency. They include directional arrows to indicate the path of travel. They were found in areas where exit is not apparently seen. 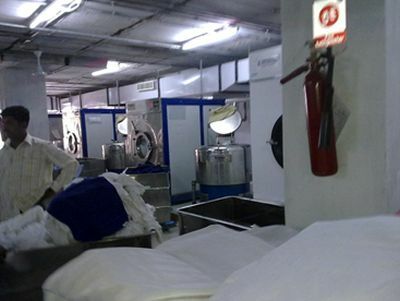 Direct Lighting is used in the Laundry to get 100% luminance for better vision and efficiency of the workers. Natural Lighting has also been provided to certain extent which also contributes to the lighting of the workspace in the Laundry.